Before :- Prashant Kumar, J.
Cr. Appeal (SJ) No. 731 of 2002. D/d. 16.4.2010. For the Appellant :- K. N. Roy, Advocate. For the Respondent :- Tapas Roy, A.P.P. Fast Track Court No. III, Hazaribagh in Sessions Trial Case No. 10 of 2000 whereby and whereunder he convicted the appellants under section 366A of the IPC and sentenced them to undergo R.I. for five years. 2. The case of the prosecution in brief as per the fard beyan of Chandeshwar Prasad Kushwaha (P.W. 1) is that on 18.6.1999 when in the morning he woke up he found that his niece Sarita Devi was missing from his house. It is then stated that he searched her in the neighbourhood but could not succeeded. It is further stated that Rajesh Kumar @ Raju was trying to marry her, but the matter was resolved in village Panchayat. It is alleged that from the morning of 18.06.1999 appellants were also missing from their house. It is alleged that his niece was kidnapped by the appellants with an intention to marry her. It is further alleged that Janki Ram, Nirmal Ram, Ayodhya Ram and Nageshwar Ram helped the appellants in commission of aforesaid crime. 3. On the basis of aforesaid statement, Katkamsandi P.S. Case No. 66 of 1999 under sections 363, 366A, 120B of the IPC instituted and police took up investigation. After completing the investigation police submitted charge sheet against the appellants as well as against Janki Ram, Njirmal Ram, Ayodhya Ram and Nageshwar Ram under sections 363, 366A/120B of the IPC. After cognizance the case committed to the court of Sessions as the offence under section 366A of the IPC is exclusively triable by a court of Sessions. 4. 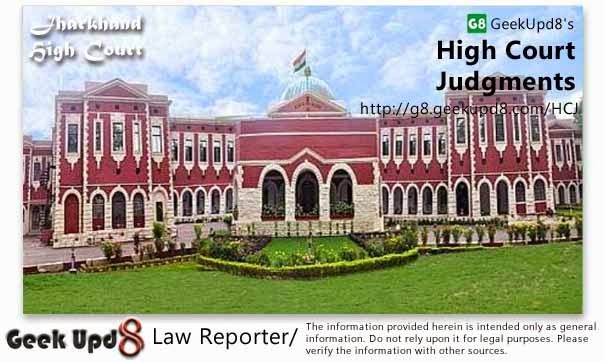 It appears that 1st Additional Sessions Judge, Hazaribagh vide his order dated 14th of August, 2001 framed and explained charges against the charge-sheeted accused persons under sections 366A and 120B of the IPC to which they pleaded not guilty and claimed to be tried. Thereafter the prosecution examined altogether nine witnesses in support of his case. Thereafter the statements of accused persons recorded under section 313 of the Criminal Procedure Code, in which their defence is of total denial. It then appears that the learned court below after considering the evidence available on record acquitted coaccused, Janki Ram, Nirmal Ram, Ayodhya Ram and Nageshwar Ram. However by the said judgment, learned court below convicted and sentenced the appellants as stated above against that present appeal filed. 5. While assailing the judgment of court below Sri K.N. Roy, learned counsel for the appellants submits that there is absolutely no legal evidence against the appellants. It is submitted that learned court below convicted the appellants on the basis of statement of victim girl recorded by the I.O. during investigation under section 161 of the Criminal Procedure Code as well as her statement recorded by a Judicial Magistrate, Hazaribagh under section 164 of the Criminal Procedure Code It is submitted that the statement made under section 164 of the Criminal Procedure Code is not the substantive piece of evidence and the value of the same is only to corroborate and/or contradict the person who makes such statements. It is further submitted that the statement made by a witness under section 161 Criminal Procedure Code can only be used for contradicting him. Admittedly in the instant case the victim girl, namely, Sarita Kumari has not been examined as she died prior to submission of charge sheet. Thus the aforesaid two piece of evidence cannot be looked into. Accordingly, it is submitted that learned court below had committed serious illegality in convicting and sentencing the appellant, therefore, same cannot be sustained in this appeal. 6. Learned APP opposed the contention of learned counsel for the appellants and submitted that circumstantial evidence available on record are sufficient to convict the appellants. It has been brought on record that at the previous occasion also the appellant Rajesh Kumar forcibly tried to solemnize marriage with informant's niece. However the matter was resolved between the parties. It is further submitted that the appellants were arrested from Kuju while they were in company with the victim, which shows that the appellants and non else had committed the present crime. Accordingly, it is submitted that the learned court below had rightly convicted and sentenced the appellants. 7. Having heard the submission, I have gone through the record of the case and carefully scrutinized the evidence. There is no direct evidence to prove that the victim girl Sarita Kumari kidnapped by the appellants. P.W. 1 Chandeshwar Prasad Kushwaha ( informant and uncle of victim girl), P.W. 2 Baleshwar Ram, P.W. 3 Mohan Mahto, P.W. 4 Triveni Sao, P.W. 5 Tek Narayan Mahto, P.W. 6 Umesh Ram and P.W. 7 Ram Sunder Prasad ( father of the victim girl) are hear say witnesses on the point of occurrence. They stated that they did not see that the appellants were taking away Sarita Kumari. They further states that they came to know about the same from Sarita Kumari, when she returned. It is an admitted position that the Sarita Kumari committed suicide after 15 days of the occurrence. Thus she has not been examined in the court. However, it appears that learned court below had considered her statement made under section 164 Criminal Procedure Code and also recorded by I.O. (P.W. 9) during the investigation . It is well settled that statement under section 164 Criminal Procedure Code is not a substantive piece of evidence. It can be used only to corroborate or contradict the statement of witness. It is equally well settled that the statement under section 161 of the Criminal Procedure Code of a witness can be used only for contradicting him. Under the said circumstance, the aforesaid two statements of Sarita Kumari under sections 161 and 164 Criminal Procedure Code cannot become the basis for conviction. Thus, in my view, the court below had committed serious illegality by convicting the appellants on the basis of aforesaid statements. 8. Now coming to the circumstantial evidence as pointed out by learned Additional P.P. , it is relevant to mention that the prosecution witnesses are contradictory in this respect. P.W. 1, informant had stated that before the occurrence Rajesh Ram and Mannu were trying to marry his niece. Thus it is not clear from his evidence as to who was trying to marry with Sarita Kumari. P.W. 2 has stated that only Raju was trying to marry with Sarita, P.W. 3 who is grand father of Sarita Kumari had only stated that accused persons teased her. P.W. 4 had not stated anything in this respect. P.W. 5 had also stated that a panchyati was held in the village in which some directions were given to the appellants and his family members for keeping peace in the village. He had not stated what for the said panchayati took place. P.W. 6 had also not stated anything in this respect. P.W. 7 who is father of victim Sarita Kumari had also stated that Rajesh had teased his daughter. Thus whether both the appellants were trying to marry with Sarita Kumari and/or only Rajesh Kumar had teased her has not been established beyond the shadow of all reasonable doubts. 9. Apart from aforesaid, it has been brought to my notice that the appellants were arrested from Kuju along with the victim girl. In my view the said circumstance has no help to the case of prosecution. In the absence of any direct evidence of kidnapping, it cannot be ruled out that the girl might have gone to Kuju on her own or with some other persons. It may also be possible that on the same day appellants might have gone to Kuju and after seeing the victim girl at Kuju Chowk, they might have started talking to her and by that time police might arrive there and arrested them. Thus, from the aforesaid circumstance, it cannot be inferred that the present crime has been committed by the appellants and non else. 10. In view of the aforesaid discussions, I find that the impugned judgment of conviction and order of sentence suffers from material illegality and irregularities and therefore the same cannot be sustained in this appeal. 11. In the result, this appeal is allowed. The impugned judgment of conviction and order of sentence passed against the appellants is set aside. The appellants are acquitted from the charges levelled against them. It appears that both the appellants are on bail. They are discharged from the liability of their bail bonds furnished by them.